Rachel received her Bachelors of Science in Exercise Science and her Doctorate of Physical Therapy from the University of Alabama – Birmingham. After having lived in the southeast her entire life, Rachel took a trip to visit a fellow classmate who was doing a clinical rotation in Seattle and fell in love with the city. Rachel had the opportunity to spend some time at MTI Physical Therapy’s First Hill clinic and decided to pursue a career with the company. She joined MTI immediately after graduating from UAB, and plans to pursue a residency in manual therapy from the Ola Grimsby Institute in the upcoming year. 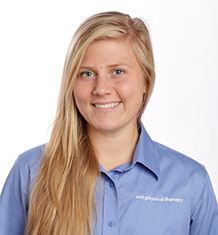 Rachel has always had an interest in the medical field oscillating between a variety of specialties, but eventually deciding on physical therapy due to the specialized and holistic care that therapists give to their patients, as well as the time that therapists are able to invest in their patients. She enjoys all realms of physical therapy – acute care, long-term neurorehabilitation, geriatrics and pediatrics, but being an athlete herself, gravitates towards orthopedic, sports, and post-operative rehabilitation. Rachel’s hobbies outside of patient care include trail and ultra-running, hiking, cooking (and eating — hence all the running), playing piano, and traveling.